One of the most basic and most important aspects of quantification is “how many”. For instance, how many neurons are in the striatum or how many cells are in a liver is an important quantity to address the understanding of biological aspects such as function, development, and development. Counting seems like a rather simple process, but to do it properly there are complications. In the discussion below, remember that stereologists call objects the generic term ‘particles’ to cover all of the various disciplines using stereology. Shape means that the shape of the particles being counted should not affect the process. If a particle is shaped like a pyramid or a sphere, it should not matter. If some particles being counted look like doughnuts and other particles look like bananas it should not matter. Size is important. If the particles vary in size in an unpredictable manner, it should not matter. Many older techniques assume that all particles being counted were essentially the same size. This often proves incorrect. Orientation means that the particles should not be assumed to be oriented in some sort of random fashion or to be pointing in the same direction. Distribution is the idea that particles need some sort of placement in order to be counted correctly. No assumptions should be made that the particles are randomly distributed or that they are evenly distributed. Removing these 4 assumptions is extremely important for all disciplines using stereology. Stereology has developed methods to get the correct answer no matter how particles are shaped, how particles are sized, how they are oriented, or distributed. The probe that is used to count is called the counting frame. The counting frame is usually shown as a red and green probe, but it can also be shown in a black with part of the counting frame dashed. Figure 1. The counting frame, showing acceptance and rejection regions. The counting frame is an interesting probe since it is asymmetrical and extends to infinity. The red lines (or solid black) border the rejection region and are known as the rejection lines. The green lines (or dashed lines) pass through the acceptance region and are the acceptance lines. The rejection and acceptance regions cover everywhere. The border between these two regions extends to infinity. Part of the border is the extensions above and below the counting frame. These are often called the ‘tails’ of the counting frame. The counting rules are stated in many different ways, although they all mean the same thing. One form of the rules is that a particle is counted if it lies entirely within the counting frame or if it touches an acceptance line without touching a rejection line. Another way of stating this is that a particle is counted if it intersects the counting frame, but not a rejection line. Figure 2. An example of using a counting frame to include or exclude objects. Figure 2 is a simple illustration of a counting frame and a number of differently shaped particles. The check marks in green show the particles that are counted and the check marks in red show why some of the particles are not counted. There are six particles in all, all overlap the counting frame to some extent. Only two particles are counted. The one particle that does not overlap the counting is not counted. Four of the particles touch a red line exclusion as indicated with the red check marks. Figure 3. Four counting frames, While the Purkinje cell appears in all counting frames, it is only counted for frame 3, since it falls within the inclusion zone for that frame only. To demonstrate the claim that counting frames guarantee that cells are counted once and only once let us look at an example. Figure 3 shows four counting frames, positioned closely together. Each counting frame consists of two exclusion lines (solid lines in this example) and two inclusion lines (dashed lines in this example). Objects of interest (i.e., cells, nuclei or nucleoli, etc.) are counted provided they are found entirely within a counting frame or hit at least one of the inclusion lines of a counting frame but not any of the exclusion lines of the same counting frame. Accordingly, the Purkinje cell shown in this example is counted in counting frames no. 3 (and only in this counting frame), because it hits at least one of the exclusion lines of the counting frames no. 1, 2 and 4 each. If the counting frames no. 1, 2 and 4 would have been positioned at larger distance counting frame no. 3 (as shown in Figure 1, part C) the criteria for counting would have been the same. 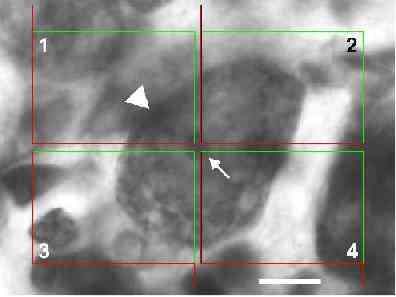 If one considers the nucleoli of cerebellar Purkinje cells as objects of interest (the arrow), the nucleolus of the cell shown in the example would also be counted in counting frame no. 3. This illustrates how the use of counting frames makes it possible to count objects of interest independent of the objects’ size. Note that in design-based stereology also inclusion / exclusion criteria in the third dimension (i.e., the section thickness in histology) have to be considered. This is shown in Figure 4. Scale bar represents 10 µm. Gundersen, H.J.G., J Microsc 1977;111:219.